Kingsport-Bristol was the Q2 hot spot for new loan and single-family home purchase originations in the seven-county Tri-Cities region, which outperformed the U.S. market. At the same time, Tri-Cities Home Owner Equity Lines of Credit eased off its Q1 20-year high. 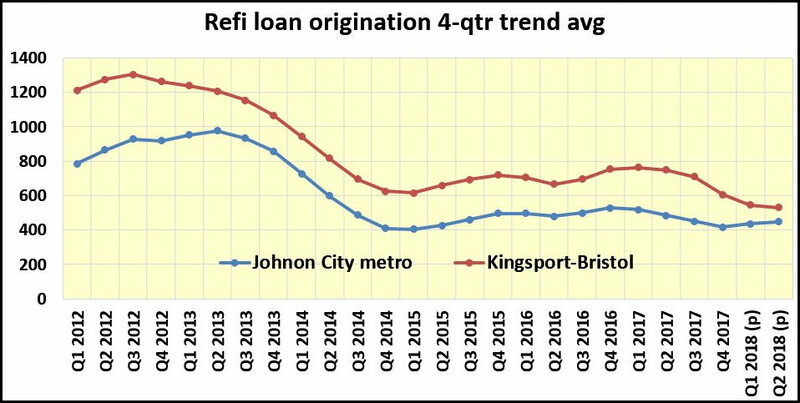 Total loan originations in the four-county Kingsport-Bristol metro area were up 25% over Q1 and 11% better than Q2 last year. At the same time, the three-county Johnson City Metropolitan Area (MSA) had a 12% increase over Q1 while year-over-year originations were flat. From a moving average perspective, Kingsport-Bristol is slowly trending higher while Johnson City has plateaued after peaking in Q4 2016. Attom Data Solution’s Q2 Residential Property Loan Origination Report shows U.S. originations were up 15% from the previous quarter and up 1% from last year. The Tri-Cities saw a 19.3% increase over Q1 and 6.2% over last year. The loan origination report is derived from publicly recorded mortgages and deeds of trust collected by Attom in more than 1,700 counties accounting for more than 87% of the U.S. population. Counts and dollar volumes for the two most recent quarters are projected based on available data at the time of the report. Tri-Cities new originations peaked in Q3 2012 at 3,752 and 2,022 the same quarter for Kingsport-Bristol. The Johnson City metro area peaked at 2,605 in Q3 2005. During the second three months of this year, there were 3,342 new originations in the region; 1,980 in Kingsport-Bristol and 1,362 in Johnson City. Kingsport-Bristol’s residential market also flexed its muscle in the drill down of raw numbers that shows a 106% increase over Q1 and a 12% year-over-year increase. The Johnson City metro is was up 27% from Q1 but 11% lower than last year. The regional total for purchase originations was 1,447, up from 900 in Q1 but only slightly better than the 1,443-last year. Kingsport-Bristol’s Q2 total was 796 compared to 386 for the first three months of the year and 708 Q2 last year. Johnson City’s Q2 total was 651 compared to 735 last year and 513 during Q1. From a trend’s perspective, Kingsport-Bristol’s 4 quarter moving average is gaining a decline from its Q2, 2016 peak. And while Johnson City’s more recent performance lagged its neighbor to the north it has been steadily gaining since Q2, 2015. Thanks to increasing mortgage rates, the refinancing trend is deader than disco in both the region and its two metro areas. But that’s doesn’t mean it’s time to put a Rest In Peace Sign on refi loan originations. During Q2 there were 983 new originations in the region. That’s a 16% improvement over the first three months of the year and down 1% from last year. The month-over-month performance shows Kingsport-Bristol claiming the lion’s share (545) from Q1, but Johnson City claimed the lead in the year-over-year performance metric with 438 new originations compared to 388 last year. 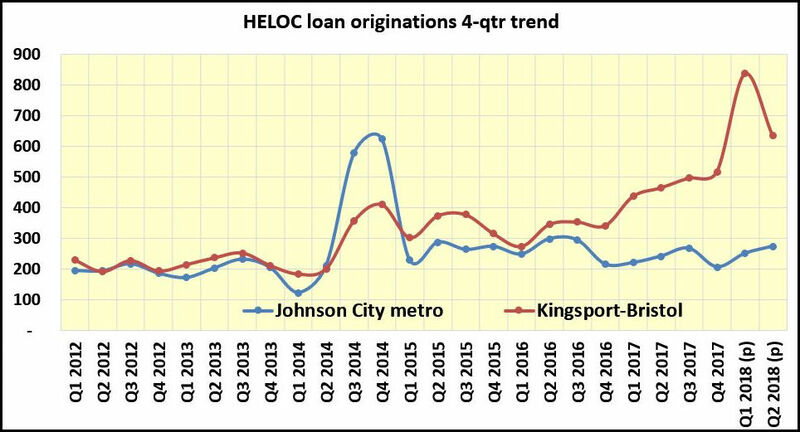 HELOC originations continue to be mixed in the region as Kingsport-Bristol homeowners pulled back on the reigns in Q2 after a six-quarter moving average trend of tapping into home equity. Johnson City homeowners have been a little more conservative with HELOCs showing a moderate increase. According to Attom’s report, there were 909 new Tri-Cities HELOC originations in Q2. Kingsport-Bristol homeowners claimed 636 of those compared to 273 in the Johnson City metro area. Even with its higher Q2 share, Kingsport-Bristol Q2 total was down 24% from Q1 and up 39% from last year. HELOC origination hit a 20-year high in Q1 at 1,087 for the region then eased back to 909 in Q2. The 28.8% decline from Q2 last year still puts the region at its third highest level in two decades. Kingsport-Bristol is the clear driver in the HELOC trend increase.